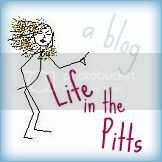 Life in the Pitts: Is this creepy? I would say a little creepy :) But I can understand his thinking with his finals and what not--LOL!! You know, I've wondered what my skull looks like. And what my head would look like without skin...like, as a skeleton. Lol well, I have also looked at cadavers in my college career... so to me it's not. But, yes to the average person... a little creepy. I always know what my husband is studying based on the random comments he says to me! It can definitely get weird (he's in grad school for psychology)! next thing you know-open door peeing. Not creepy to me! My hubby is in medical school, so we have similar conversations frequently. I've totally been there. We went to Home Depot and Dave asked for the saw that's really good at taking off skulls. I was surprised no one called the police! Haha... yeah, that's awesome. I'd be a little creeped out if Michael said that to me. Then again, he isn't studying that stuff. sounds like an episode of Bones! You are too funny! I hopped over from the Girl Creative. I so luv her New Friend Fridays! I see you are a transplant to the Steel City. I hope You and Hubby are STEELER fans!! It IS the law there;) Happy Weekend! Uhm. Yes. kind of creepy! but hillarious, I am cracking up! I am giving you the Sunshine award. Your posts always crack me up! When my husband was in medical school he brought home this yellow toolbox one day. He asked what I thought was in it and I foolishly guessed tools. HA HA. No, it was a real human skeleton that he was supposed to use to study all year. Needless to say, we put those bones in the closet until the day he had to turn them back in. Gross! Ya, that is creepy. I wonder if he accomplished the visual of you he was trying to get. Ick!